The Mekong Delta makes up 55.5 percent of the country’s annual rice output. Shortage of floods has resulted in a hefty 50 percent decrease in sediment deposited in the Mekong Delta each year, causing Vietnam’s largest delta to face serious subsidence and likely disappearance in the future. The Mekong Delta contributes half of Vietnam’ rice production, 70 percent of fruits and 69 percent of seafood, said the Southwest Steering Committee. However, the delta is losing its dominant role in agriculture as floods enter the region at a lower frequency. “Flood often takes its toll on people’s lives but it also brings many benefits like washing out salt and acid in soil, preventing disease and adding silt to the delta. 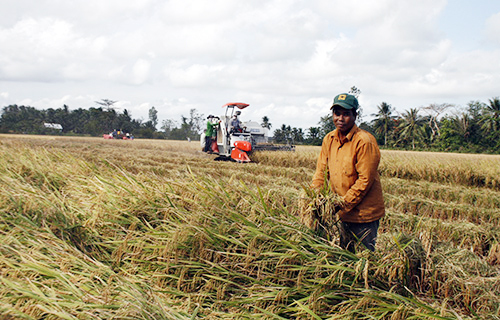 Farmers will harvest a bumper winter-spring crop after heavy floods,” said Le Van Banh, director of Department of Processing and Trade for Agro-forestry-Fisheries Products and Salt Production. Floods often sweep the Mekong Delta from May to November but this year, there’s been no sign of flood. The incident is blamed for China’s construction of hydropower projects on the upper Mekong River as well as the severe drought that hit the southern provinces from the end of last year. The expert cited an example of Ca Mau, the southernmost province of Vietnam, one of 13 pieces forming the Mekong Delta. He said that previously, the province encroached into the sea a few meters each year thanks to a high volume of sludge, sand and gravel flowing from the Mekong River upstream. Now, the case has been reversed when sea waters invade 15-50 meters into the mainland, washing out hundreds of hectares of protective forest. Tuan even recalled the days Vietnam exploited and shipped sand to Singapore so that it could construct artificial islands, but now the mining has to stop as the delta can’t add supplements from upstream. As calculated by the Mekong River Commission, floods deposit an average of 160 million tons of silt to the delta each year. However, dams on the upper Mekong Delta have retained some 50 percent of the amount. The situation will get even worse if other 11 dams of Laos and Cambodia come into operation, blocking 90 percent of sediment. The Ministry of Planning and Investment estimated about 45 percent of Vietnam’s Mekong Delta will be affected by saltwater intrusion by 2030 if hydropower dams and reservoirs along the Mekong River stop water from flowing downstream.